The global helicobacter pylori (H. pylori) non-invasive testing market was valued at approximately US$ 518.0 Mn in 2017 and is projected to register a compounded annual growth rate (CAGR) of over 3.99% from 2018 to 2026, according to a new report titled, “Helicobacter Pylori (H. pylori) Non-invasive Testing Market – Global Industry Analysis, Size, Share, Growth, Trends, and Forecast, 2018–2026”, published by Transparency Market Research (TMR) . The report suggests that factors, such as, rise in the adoption of non-invasive testing for diagnosis of H. pylori, lack of endoscopic facilities, and upcoming technologically-advanced tests from global market players for non-invasive helicobacter pylori testing in the next few years (2018-2026) are likely to boost the demand for global helicobacter pylori (H. pylori) non-invasive tests. High awareness and diagnosis rate of H. pylori infection in North America and high prevalence of the disease in East-European countries are likely to generate a significant share for the market in North America and Europe from 2018 to 2026. There has been a growing preference for non-invasive tests globally for H. pylori infection testing among patients as well as health care providers, owing to quick turnaround time for test results, higher patient compliance, and reduced discomfort usually associated with invasive tests. At the same time, these tests are high in accuracy and specificity to aid the correct diagnosis of the H. pylori infection. Non-invasive tests are also cost-effective compared to invasive endoscopic options. Among non-invasive tests, serology test is commonly prescribed by health care practitioners for H. pylori owing to the relatively lower cost and ease of conducting of the test. However, the serology test segment is expected to lose its market share during the forecast period. Regional agencies such as American Gastroenterology Association (AGA) and National Health Services (NHS) have updated their guidelines to prevent the use of serology testing for detection of H. pylori due to high incidence rate of false positives, lower specificity as compared to other non-invasive testing methods, and inability to test for eradication of the H. pylori infection in a patient associated with the test. The serology test segment is estimated to hold a market share of 30.3% by the end of 2018, while its market share is anticipated to drop to 13.7% by the end of 2026. 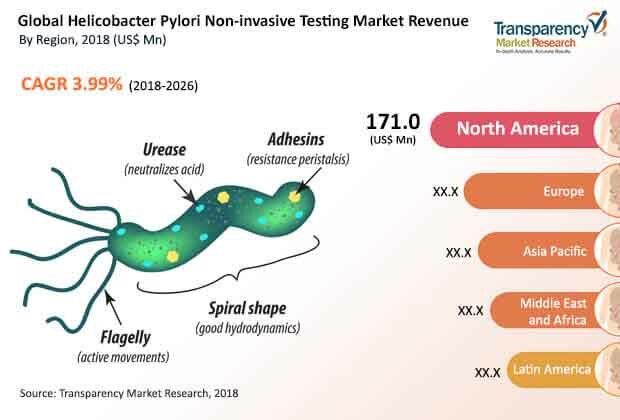 Among test methods, the laboratory-based tests segment of the global helicobacter pylori (h. pylori) non-invasive testing market is estimated to witness a significant growth during the forecast period. The segment is likely to expand at a CAGR of 3.73% between 2018 and 2026. Growth of the segment can be ascribed to the fact that a majority of these tests are performed in laboratory settings, based on laboratory methods, conducted by trained professionals in a controlled environment. Laboratories are capable of conducting high volume of tests per day and providing the results in a few hours or a few days (1 to 2 days). According to WHO, in Asia Pacific, an estimated 70% of health decisions are based on laboratory results, as laboratory-based tests provide essential support and facilitate appropriate medical intervention. Among end users, the diagnostic laboratories segment is expected to hold the leading i.e. 47.5% share of the market by 2026. This can be attributed to the large number of H. pylori non-invasive tests performed by standalone and hospital-based diagnostic laboratories. Moreover, presence of major standalone laboratories, testing a large number of patient, and high adoption of new tests and instruments by diagnostic laboratories for diagnosis of H. pylori, is expected to fuel the growth of the diagnostic laboratories segment through 2026. The helicobacter pylori (H. pylori) non-invasive testing market in Asia Pacific is estimated to expand at a significant CAGR of 4.52% during the forecast period. The market in the region is likely to be driven by the high prevalence of H. pylori in rural India, (80% or even more), where a vast population is living under poverty and gastric cancer burden, linked to H. pylori bacteria, is relatively high. North America is expected to hold the leading market share of 31.1% by 2026, due to rising incidence of gastric adenocarcinoma, peptic ulcers, and other diseases which are strongly associated with H. pylori infection. This has prompted national and regional health care agencies in the U.S. to actively promote non-invasive diagnostic tests for chronic as well as acute dyspeptic patients, with an aim to eradicate H. pylori infection from among the prevalent population. The helicobacter pylori (H. pylori) non-invasive testing market in North America is likely to register a CAGR of 3.62% during the forecast period. Prominent players operating in the global helicobacter pylori (h. pylori) non-invasive testing market are DiaSorin S.p.A., Meridian Bioscience, Inc., Exalenz Bioscience Ltd., Alere, Thermo Fisher Scientific, Biomerica, Inc., Certest Biotec S.L., Sekisui Diagnostics, CorisBioconcept SPRL and Shenzhen Zhonghe Headway Bio-Sci & Tech Co., Ltd. These key players are expected to maintain their key positions during the forecast period.